Today while many of you are enjoying Christmas meals with your family (Merry Christmas! ), the boys and I will be heading out to keep a tradition alive. This evening we will have Chinese food for dinner once JL is home from work. Last Saturday, we had an early Chanukah celebration at my parents house. Thanks to the snow storm, my brother and his family were not able to make it into town. 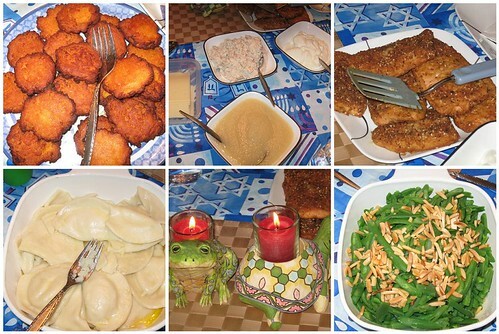 Still, we had a very delicious dinner with my parents, grandmother, and Aunt T. Here are is the delicious meal that we had. 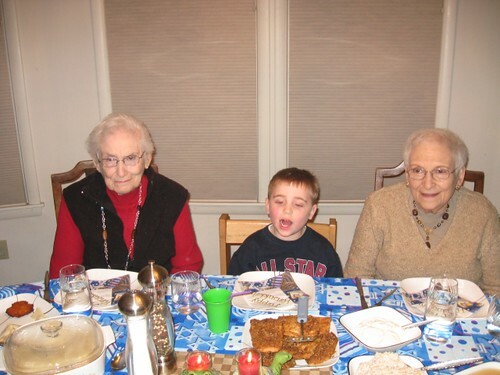 Before sitting down to eat, NHL declared that he wanted to sit between Aunt T and Mimi. Thank goodness they are good sports and allowed his wish to come true. 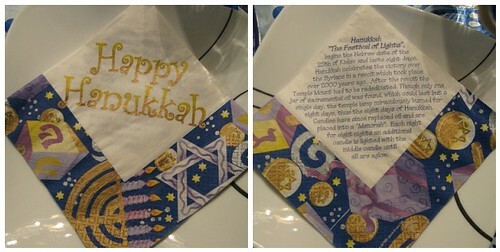 My mother had a Chanukah table cloth out and had napkins to match. Check these out. On one side it had holiday greetings, while the other told the story of the Festival of Lights. After we ate dinner, the kids played for some time, while everything was cleaned up. Then the goodies were put on the table. Right before we went to the table, JSL fell down running and landed on the back of his head. At first we did not think it was serious, but when looking back it is never right when the little guy refuses chocolate. Our time with the cheesecake and other delicious items was cut short by the call to 9-11, arrival of the paramedics, and ambulance ride to the emergency room. This will certainly not be a Chanukah that we will soon forget. Happy Chanukah!! I actually made some menorah cookies this year when I made Christmas cookies (since it was happening at the same time this year) for the therapist at work who is Jewish. She was tickled pink! And, don’t think you are so special with your chinese food on the 25th LOL! We have done that more than once due to snow and or illnesses! Have a happy day! I am waiting for the princess to wake up still!! Chinese food sounds so good! What place are you going too? I like your family pictures. Enjoy your day. Oh no – how is the little guy doing? Holiday wishes of peace and health – especially health right now.